Remove the six screws to remove the mount. Mine is missing one. Remove the auto stop down tab, that brass piece. Mine appears to be missing the tab on one side, but it still does its job. 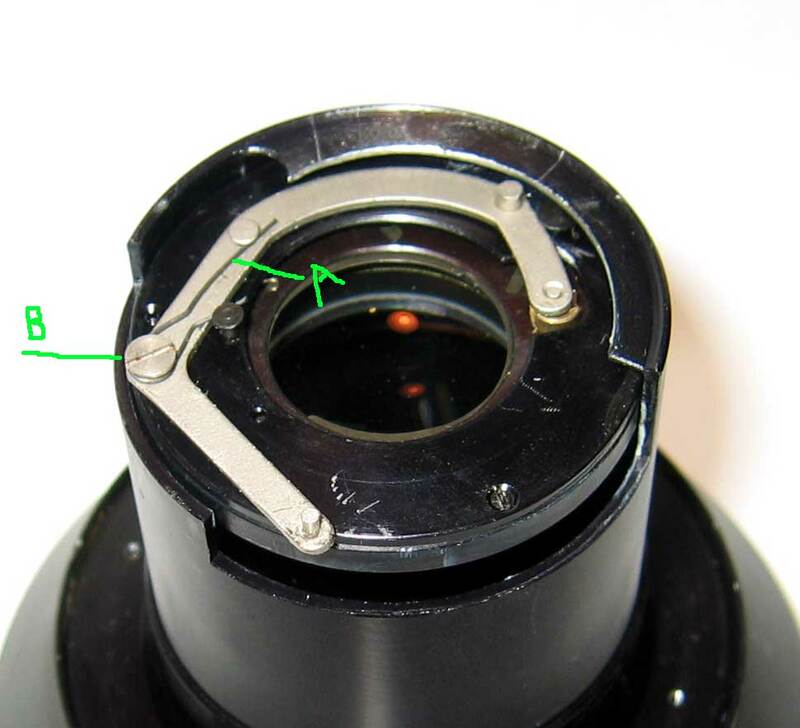 Remove the three screws and pull of the focusing assembly. 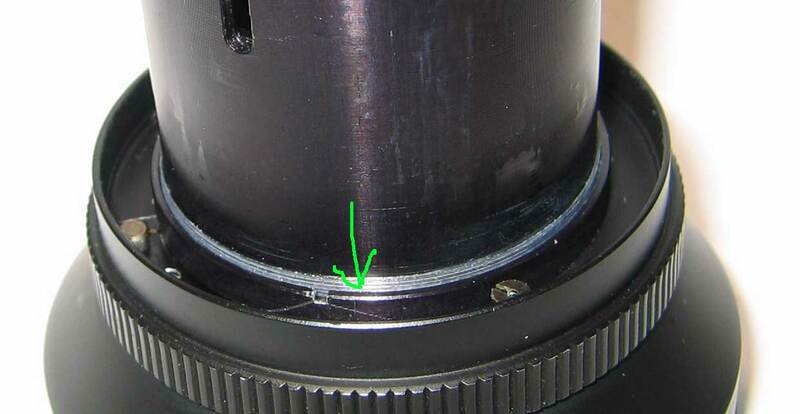 Make a mark (A) to locate the adjustable tab, remove the two screws (B) to remove the tab. Unhook the spring (A), it's held in place by (B), so it won't go anywhere. 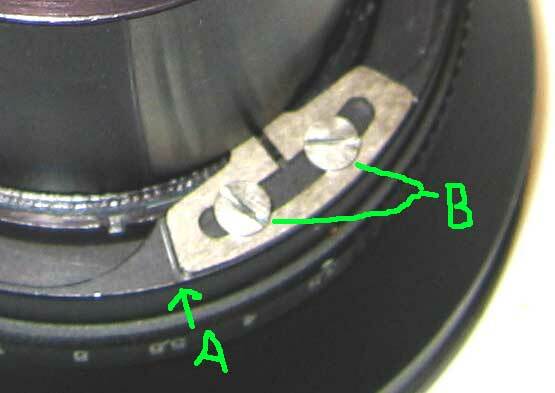 Remove the screw (B) and slide out the stop down lever. 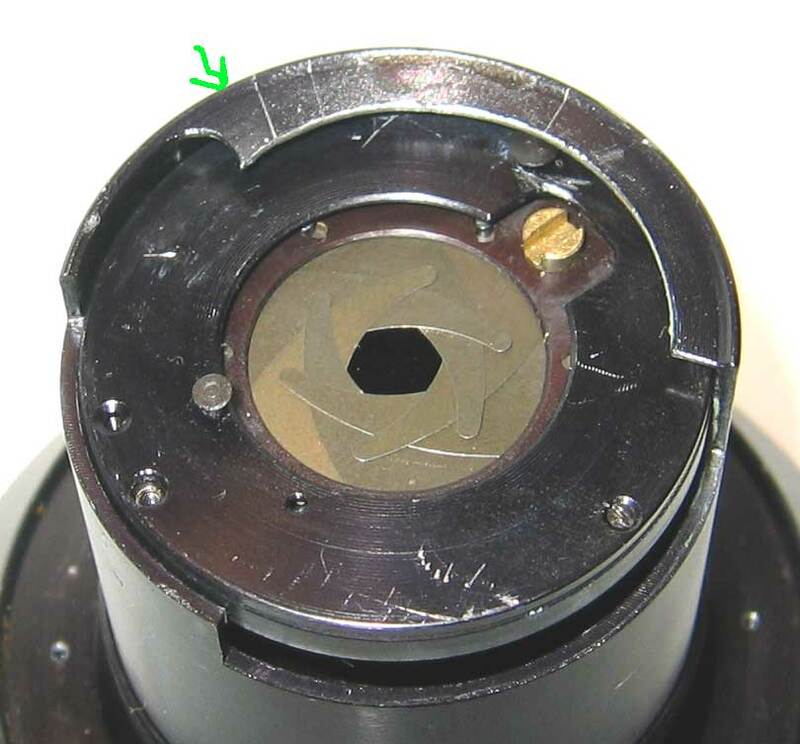 A view of the stop down lever, screw and spring. 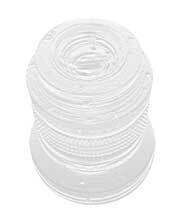 Pull off the f/stop sleeve. 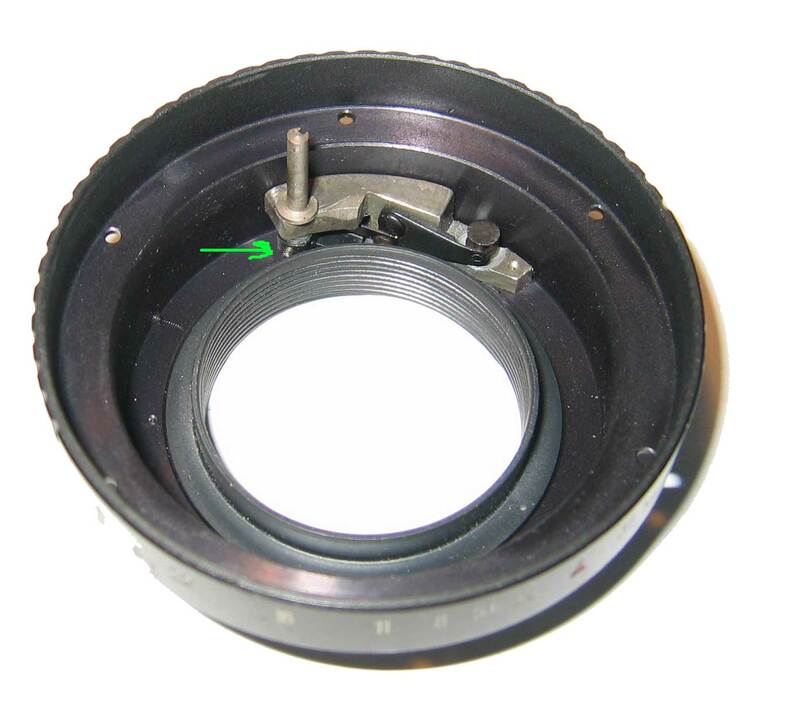 Unscrew the large ring nut and remove the f/stop ring. 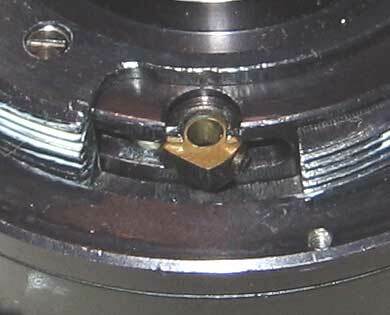 Watch for the click stop ball bearing. 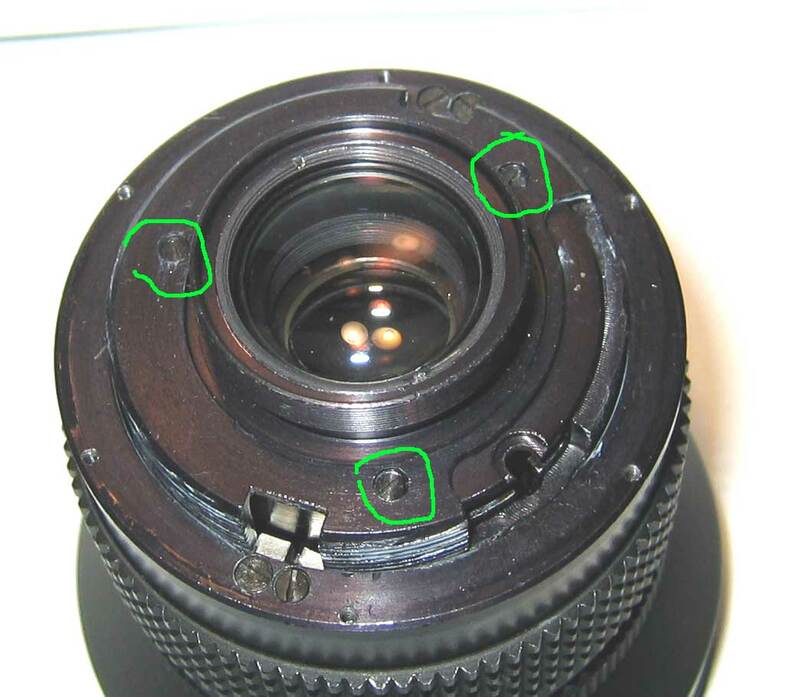 Remove the four screws holding the rear lens housing and lift it off. 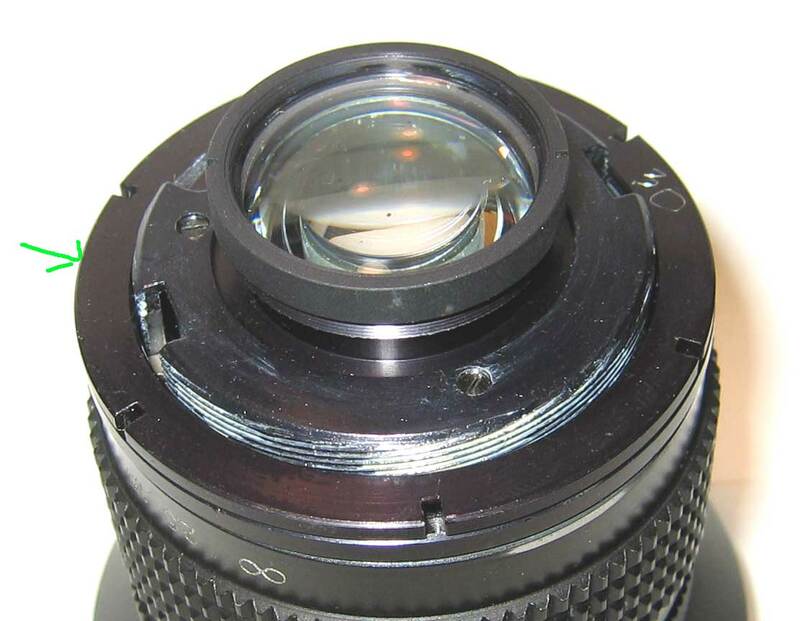 The rear lenses have been removed in this picture. 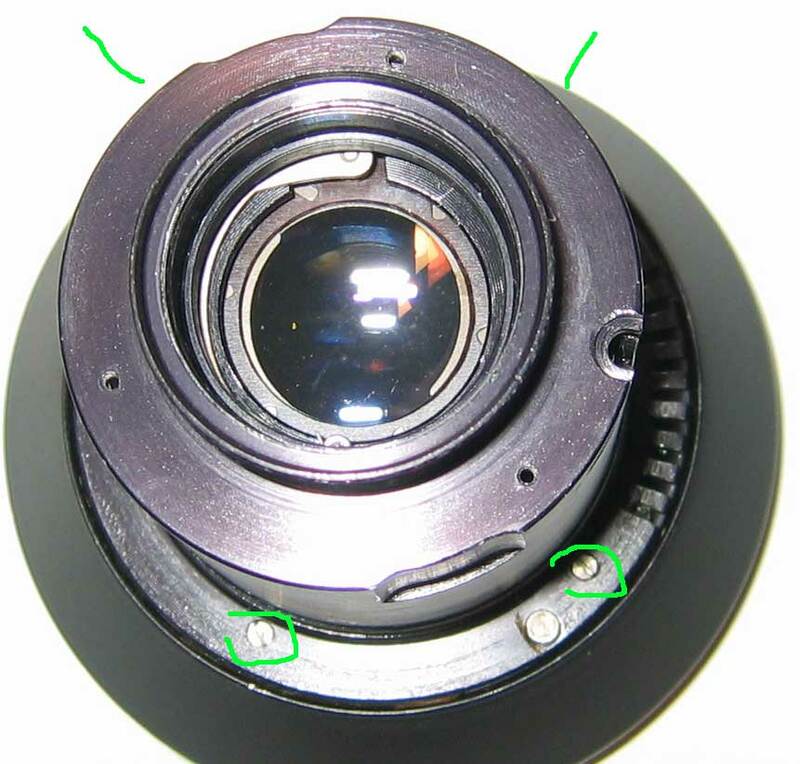 Remove the three screws to remove the iris cover. One is missing on mine. Notice this cover only goes on one way. 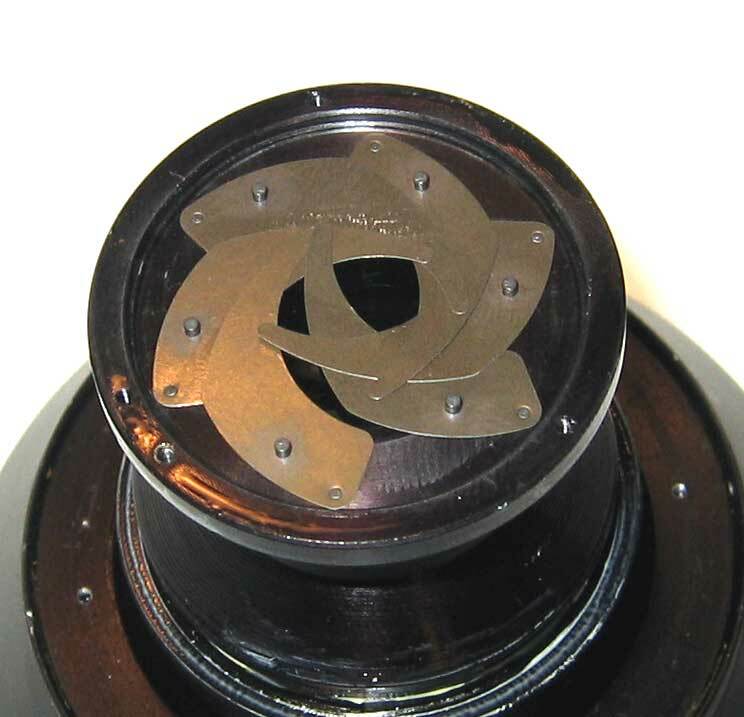 Remove the ring with the brass slot. Remove the leaves, notice they all overlap each other. There is no top/bottom leaf. Clean this with light fluid. Keep the lens clean. I put some lighter fluid in a 35mm film canister and soaked the leaves in it. Also clean the ring and the iris cover. Use tweezers to reinstall the iris leaves. The pin closest to the edge goes down. Set the leaves about mid travel and place the iris ring back on with all the pins in their correct slots. 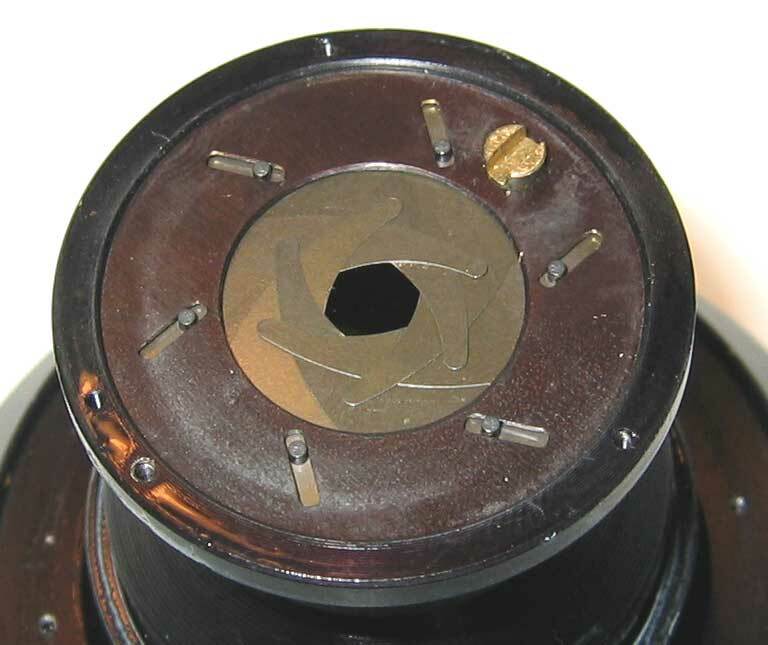 Note the position of the brass slot, it goes on the opposite side of the double screw holes. Put the iris cover back on, make sure you can operate the iris freely. Slide the f/stop sleeve back on. Reinstall the stop down lever. The screw holds the spring. Long end of the spring hooks on the lever. Position the f/stop sleeve so the ramp is pushing on the stop down lever. 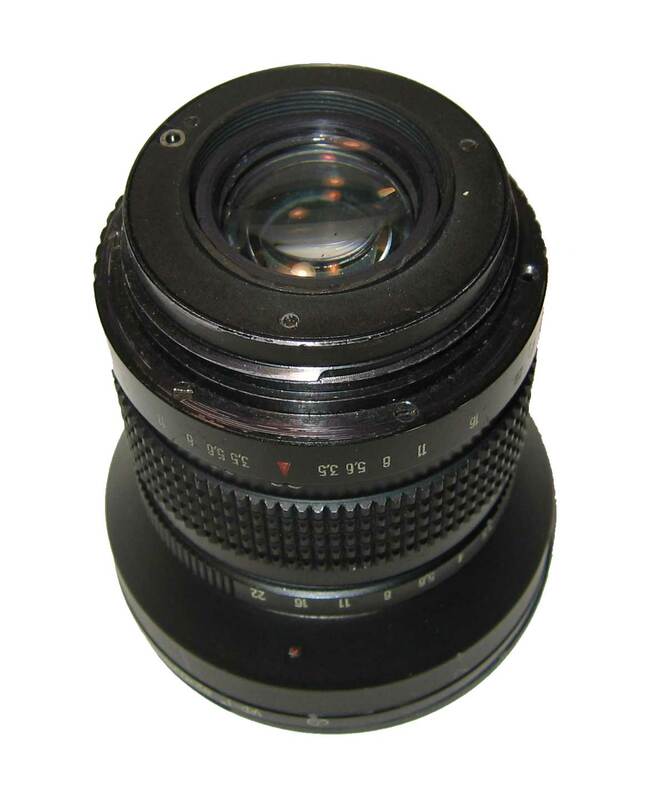 Put the f/stop ring back on. Tighten down the ring nut that holds it. 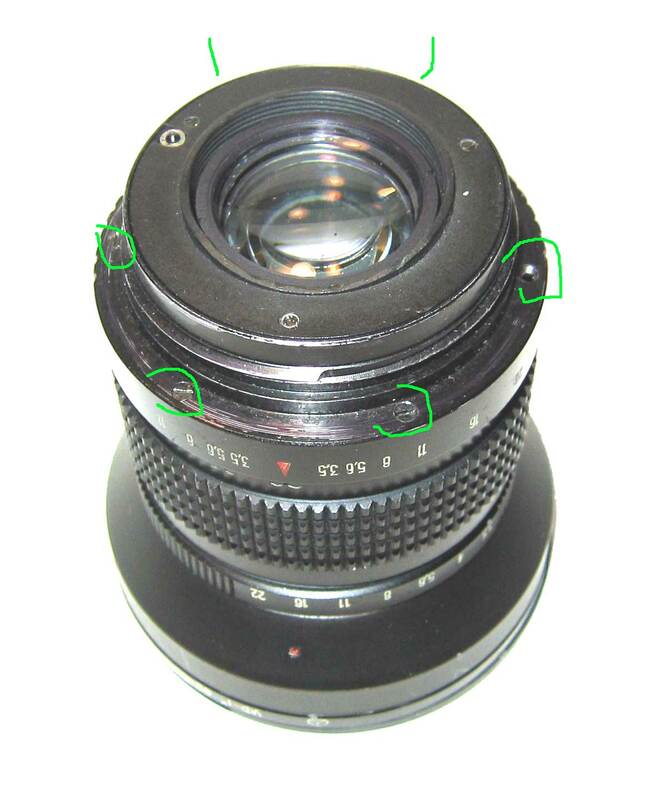 Put the f/stop tab back one, using the mark you made earlier to position it. 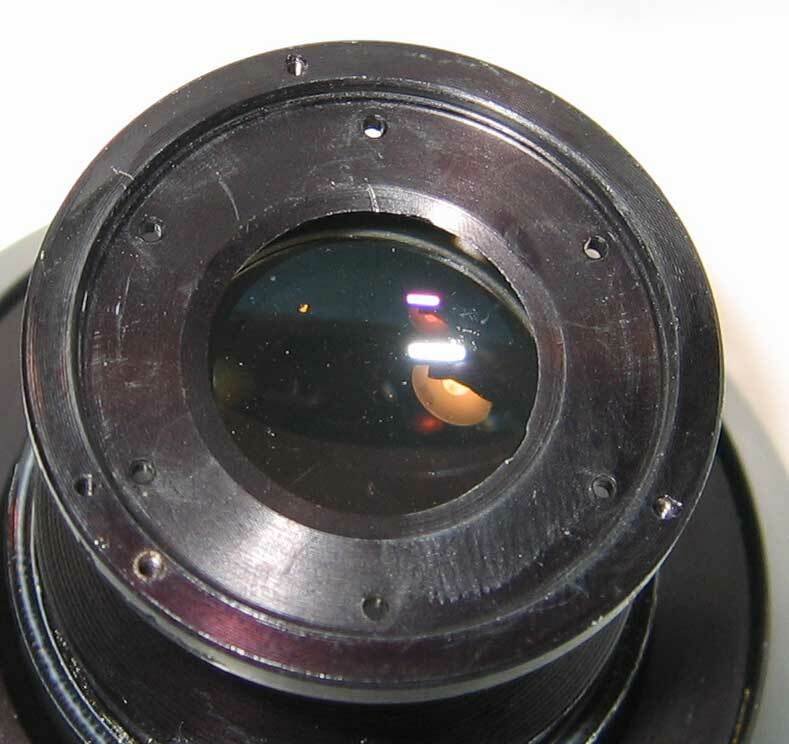 Reinstall the rear lens assembly. 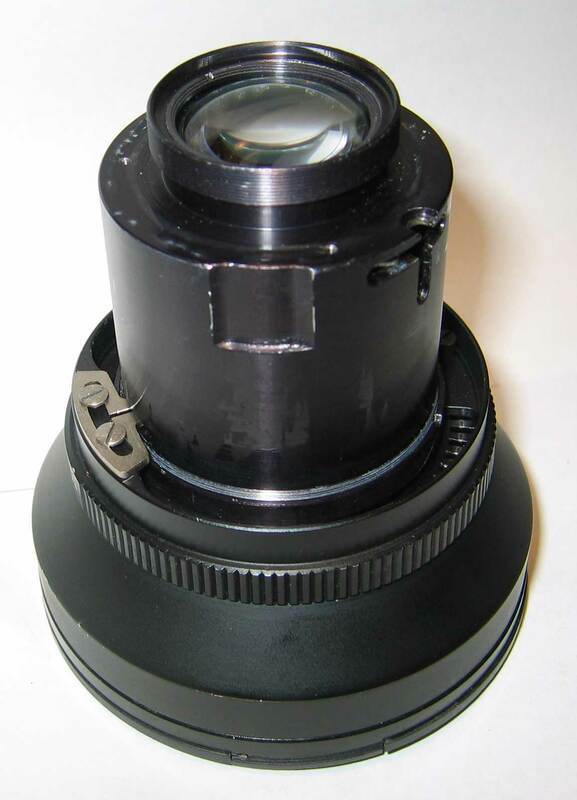 Reinstall the focusing helical assembly. Reinstall the auto stop down tab, so that the single tab goes behind the lever. Reinstall the spacer and mount. 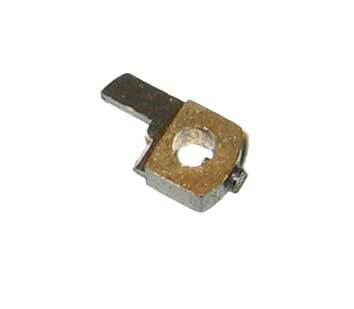 The long shaft has a slot in it, the slot lines up with the small screw inside the tab. 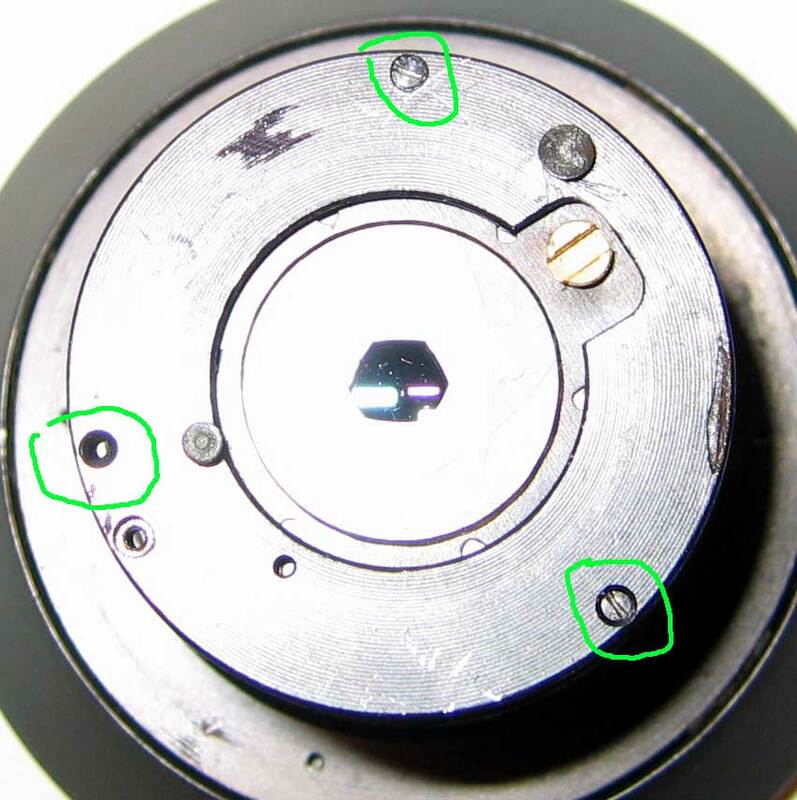 If the lens doesn't fully open with the stop down pin depressed, the screw pointed to will let you adjust the slotted shaft.